Back in 1982, a group of local sailors had the vision for an organization that would promote junior sailing and create opportunities for both members of Macatawa Bay Yacht Club (MBYC) and youth in the Holland community who were interested in sailing. This shared vision, along with a couple of borrowed sailboats, became the birth of Macatawa Bay Junior Association (MBJA). At the time, there wasn’t even an instructor boat, yet the organization held the course and began to grow. Over the past 35 years, MBJA has enabled countless participants and graduates to learn the joys and thrills that come from sailing on the open water. For many, this has even become more than a sport or activity – sailing has become their way of life. With the help and financial support from MBYC and the Holland sailing community, our association has instructed graduates who go on to achieve great things, like becoming collegiate All-Americans, joining the U.S. Optimist Dinghy International Travel Team, and competing internationally in the Laser Radial and 420 class. With that said, we consider the most significant impact of our program to be the number of kids who graduate with sound, water safety fundamentals and a lifelong love of water and sailing. If you are looking for an example of the impact junior sailing can have on a young person’s life and the importance of this investment in our youth, you need look no further than the chairman of our own board of directors, Steve Sisson. Steve was one of the early graduates of the program, and now he works diligently to ensure its growth and legacy. Whereas MBJA may have come from a humble beginning, the future of our organization is certainly a bright one. At the helm, we are proud to have Nick Hovland as our Sailing Director. Nick came to us after spending the previous six years running a highly-successful junior sailing program at the White Bear Yacht Club (approximately 20-minutes north of St. Paul, MN). Here with MBJA in Holland, Nick leads a talented team of U.S. Sailing-certified instructors, who are responsible for teaching approximately 300 students every year in the skills necessary to be successful sailors. Learn-to-sail instruction is only one of the valuable services MBJA provides. We also field “Team Macatawa” (a sailing team that competes in regional events during the summer) and maintain our fleet of Optimist Dinghies, Club 420’s, Lasers, and a J22 keelboat. Through the MBJA, you can trust that the future of sailing will continue to be assured – one child at a time. No matter if you are one of the many graduates now a part of our sailing community, or you’re simply interested in learning what Macatawa Bay Junior Association is all about, we are glad to have you onboard! To learn about how you can help our association help young sailors, please see our Donations page. Sailing instruction at MBJA is conducted in a large variety of boats. These include Optimist Dinghies, Club 420s, Lasers and J22s. Between these classes of boats we have curriculums to suit all ages, abilities, and sizes. 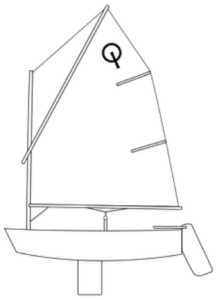 The Optimist Dinghy, nicknamed Opti, is the largest junior racing fleet in the world and the international standard in junior instruction. The boat’s simplicity and stability make it ideal for teaching young beginners while the popularity of the Optimist class makes the boat extremely challenging for pre-teen racers. MBJA owns a fleet of 12 well-maintained Optimists to use in its programs. Some of our Team Mac sailors who travel bring privately owned boats for practice and regattas but MBJA does offer charter boats to students who would like to try racing. The Club 420 is the most popular and versatile double-handed junior boat in North America. The 420 is sturdy and safe while providing the challenge of having a spinnaker and trapeze. The boat is best suited for sailors 12-18 years of age and over 100 pounds. MBJA has a fleet of 9 well-maintained, competitive Club 420s for use in the summer program. Club 420 sailors participating on Team Mac are our most experienced 420 sailors and although boats are supplied during practices, students must charter or supply their own boat for regattas away from MBJA. The Collegiate 420 is used for our College and High School sailing programs in the spring and fall. The boat is the same as the Club 420 with the exception that the trapeze and spinnaker gear are removed. Sailors enrolled in the High School sailing program use boats owned by MBJA and Hope College and therefore, are not required to own their own boat. The Laser is the single-handed option for sailors who are too big or too old to sail the Optimist. 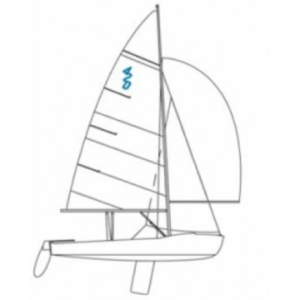 The Laser can be configured with three different sail plans, providing great versatility across a wide range of sizes. 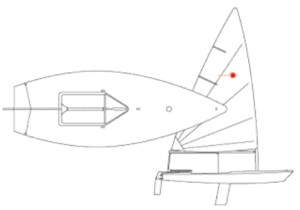 Lasers are best suited to sailors 13 years of age or older, over 125 pounds, and focused on racing. Lasers are one of the fastest growing one-design classes in North America and the primary singlehanded boat used in youth sailing events. 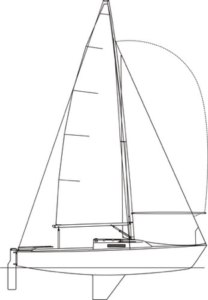 The J/22 class sail boat is very popular racer/daysailer that is well suited for the Chesapeake Bay area. Its dinghy-like steering and handling, relatively small overall size, and large cockpit make it ideal for 3-4 person racing. The non-overlapping jib makes for easy boat handling. For additional performance and challenge, a spinnaker can be flown by one person in the cockpit and one person doing foredeck. Since 1993, MBJA has operated on the grounds of Macatawa Bay Yacht Club, serving the Holland community as a 501c(3) non-profit sailing school. MBJA is a proud member of US Sailing. © 2019 Macatawa Bay Juniors Association All Rights Reserved.